And now, for an almost ran... 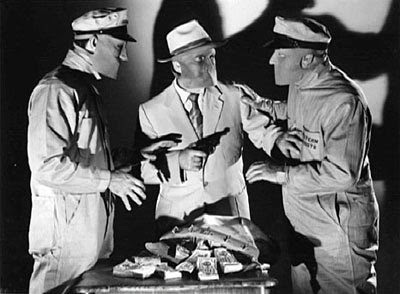 I almost contemplated running a review of the wickedly clever Kansas City Confidential, out on Blu-ray this week, for the Film Noir Preservation Blogathon (see my previous post), sort of "kill two birds with one stone" kind of thinking since I was obligated to write about a review copy anyway. When I suggested it to an editor of mine at another publication—before having watched it for myself, mind you—the guy almost strung me up by my you-can-guess-what. And rightfully so. The quality of this Blu-ray issue from a company called Film Chest is highly questionable, despite being labelled an "Essential" disc by another respected publication I've written for (which also gets it wrong in stating it's a Region 1 disc; it's actually Region 0). True, the film itself is unquestionably essential. Not only is it a perfectly executed example of the web-of-deception-closing-in-on-itself trope so often found in the best films noir; it is an outstanding example of director Phil Karlson's brutal stylings; it's a fine showcase for thuggish character actors like Neville Brand (Birdman of Alcatraz), Jack Elam (Once Upon a Time in the West) and Lee Van Cleef (The Good, the Bad and the Ugly); and it has historical interest due to its obvious influence on Quentin Tarantino's Reservoir Dogs (1992). That's about the last I'll write about Kansas City Confidential, the film, because I don't wish you to confuse my glowing praise for the movie as an endorsement for this mediocre Blu-ray edition. The digital restoration for the film suffers from overreach. In an effort to wipe dust and grime off of the badly damaged elements (which Film Chest demonstrates in a brief "restoration demo," also included), the sharp graininess inherent to the film is also obliterated. The result is a smooth waxiness to the complexion of the actors that is often distracting, a prettifying of the hoods and scumbags which undermines the sweaty, hard-boiled quality of the story being told. Also, both the 5.1 and 2.0 audio mixes included seem a bit tinny-sounding at times. Admittedly, my expertise at describing such technical problems is limited (for that I refer you to Gary Tooze's excellent assessment at DVD Beaver), which is all the more reason to be wary. If such defects are so noticeable to me, then there's definitely something wrong. I promise to revisit Kansas City Confidential in the future, and give the movie, not the disc, a proper critical analysis.